Looking for a Close up Magician in Guildford? If you are looking for one of the best Magicians in Surrey, Roger Lapin has performed in Guildford many times and is guaranteed to provide amazing close up magic whatever the event. If you want amazing magical entertainment for your Wedding, Party or Corporate Event in Guildford. Roger Lapin is the perfect choice. Providing Close up or Table magic for any event he can entertain all your guests with mind blowing magic performed right in front of their eyes. Having recently performed at the Raddison Edward Guildford Hotel and the Mandolay Hotel Roger is very familiar with the top venues in Guildford. Performance times vary from 1 to 3 hours depending on the number of guests and the type of event. 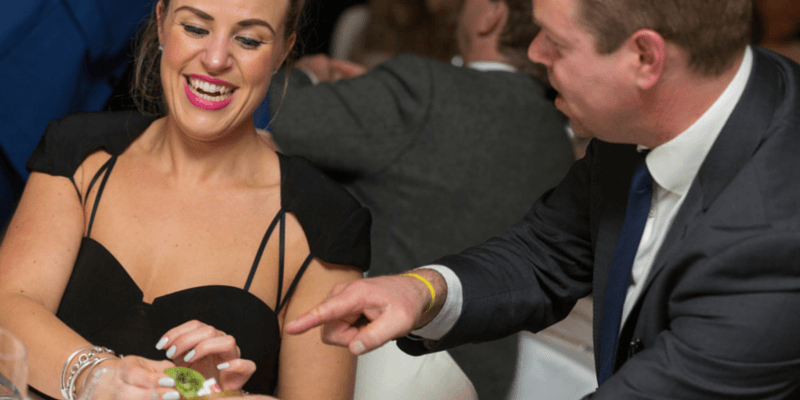 For a Wedding with 80-100 guests a typical performance time would be 2 hours, if you are entertaining 300 guests at your companies Christmas Party then you are going to need two magicians. Roger can provide a second magician for your event so you only have to deal with him. It’s not just big parties and weddings, if your event is more intimate like a family gathering for a 40th birthday in a restaurant Roger can perform his close up magic around the tables during your meal. Please allow 1 hour for 30-40 guests or for a more relaxed performance 90 minutes. So how much is this all going to cost? The main factor determining the price is what day, if your event is on a Saturday evening it will be more expensive than a Tuesday afternoon. For your personalised quote please contact Roger directly and he will be in touch within a few hours.